This past week turned out nothing like I’d thought it would. I was supposed to be out-of-town through Thursday, but when a death in the family made it impossible for the keynote presenter to be present at the retreat I’ve been planning for the last 18 months, we had to postpone the event and I ended up coming home from Minnesota almost a week early. Looking on the bright side, I relished the idea of a few days in the office with no meetings or appointments on my calendar so that I could get caught up on projects that have been on hold since before Holy Week. 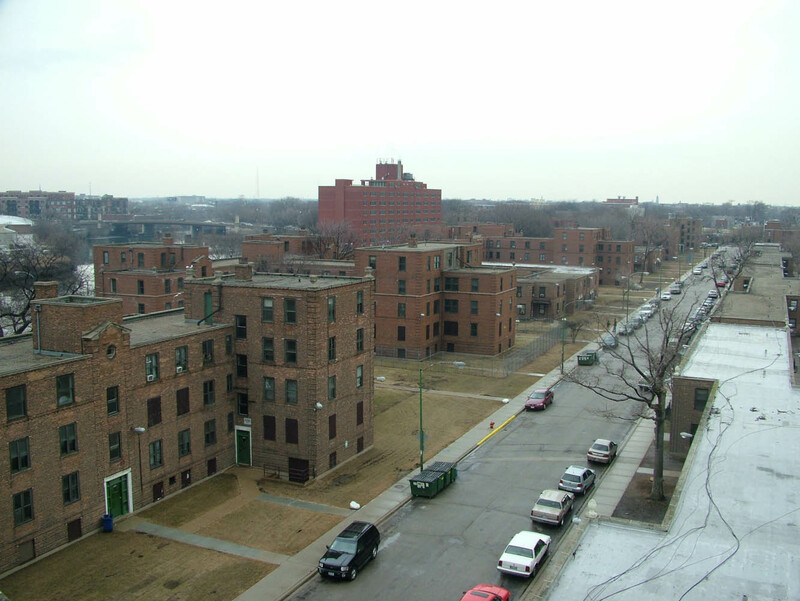 Lathrop Homes, Hoyne Ave. south of Diversey Ave. Instead, I returned to a set of requests for assistance with housing concerns here in the neighborhood. I spent most of Wednesday with residents from Lathrop Homes and staff from the Logan Square Neighborhood Association at a Chicago Housing Authority committee meeting. After years of conversations and negotiations between community leaders and CHA planners struggling to find a common vision for affordable public housing in our community, we were surprised to see that the agenda for this meeting included preliminary approval of a 3.4 million dollar project that would replace two existing buildings at Lathrop Homes with new construction, and quality affordable housing with full-price, market rate units. This work was being called “Phase One” of the Lathrop Plan, which was particularly difficult for Lathrop residents and neighborhood activists to understand, since they have been working for years to come to agreement on a Master Plan for Lathrop Homes that still does not exist. How the city could move forward with Phase One of a plan that had yet to be approved defied any sense of good faith negotiation or fair process that we could imagine. By the time our caravan of cars arrived at the CHA office downtown and we’d signed in with the Board secretary to speak at the meeting, there were about twenty of us representing the neighborhood in the room. We sat together on the right, looking like the kind of crowd you might find at the grocery store — dressed for comfort (except for me in my black clerical with stiff white tab collar), chatting throughout the proceedings and translating for those whose Spanish was stronger than their English. Across the aisle sat a regiment of impassive men, silent in their suits and ties and briefcases. It was not hard to guess whose interests were being represented across the room’s geography. At the appointed moment during the CHA’s real estate development committee meeting, we were offered a chance to comment on the proposal. 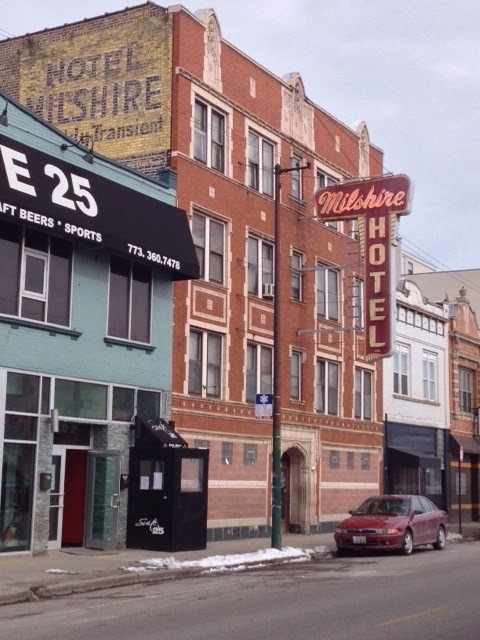 As person after person rose to address the commissioners, some with quiet confidence, others with trembling hands or voices, testimony was offered about the need for quality, affordable housing in our quickly gentrifying neighborhood. I remember thinking, as I waited for my turn, that this is why it is important that we practice giving our testimony in church, at home, among friends — so that when it is called for in public, in moments filled with tension and crisis, we have words to lean on. Our neighbors and their words were still ringing in my ears as I opened the scriptures to prepare for this morning’s worship. 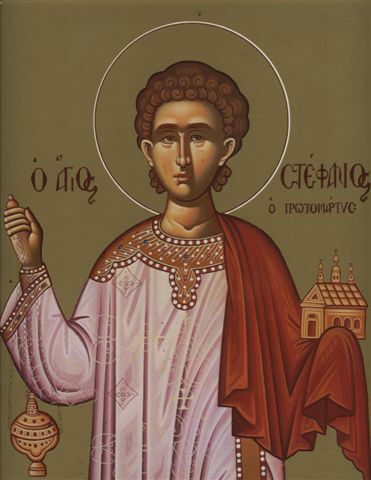 There, beginning in Acts, we join a story already in progress about the church’s first martyr, Stephen, a deacon who’d been called to step into the early church’s ethnic politics to make sure all were being treated equally and shown the kind of service that marked Christ’s ministry among them. If you’re trying to remember who Stephen was, don’t be too hard on yourself. He wasn’t one of the twelve apostles, he was one of the seven deacons ordained and appointed by the apostles to care for the poor and the widows in the early church. He makes his first appearance in the sixth chapter of Acts, and in the seventh he is killed. But in between his arrival and his exit, we get the portrait of a saint who understood the cost of discipleship and who stood up for the weak and the foreigners, and against the bigoted passions of the crowds. The first clue that Stephen was caught up in conflicts about diversity come from the very reason for his call. The early church was having difficulty managing the diversity inside itself. The Hellenists, or the members who came from outside Jerusalem in the predominantly Greek-speaking surrounding countries, were complaining that the Hebrew widows in the congregation were getting preferential treatment. The apostles didn’t want to concern themselves with this. You might remember their response, “it is not right that we should neglect the word of God in order to wait on tables…” (Acts 6:2b), so they appoint seven deacons. Stephen is introduced at this point as “a man full of faith and the Holy Spirit,” and the scriptures say that “full of grace and power” he “did great wonders and signs among the people” (Acts 6:8). Almost immediately, Stephen gets into a conflict with “some of those who belonged to the synagogue of the Freedmen (as it was called).” The Freedmen, which is a translation of the Greek “Libertinos,” were former slaves who’d become Roman citizens and had some power and influence in the public sphere in relation to the Jewish faith. Digging a little deeper, it appears that there were different neighborhoods in Jerusalem for people who spoke different languages – one neighborhood for the Jews who spoke Aramaic, another for the Hellenistic Jews, or the ones who spoke Greek. The Libertinos, the Freedmen, had some influence among the Greek-speaking Jews. They’d set up a local chapter of their own religious movement, and weren’t so happy that the early followers of Jesus were finding some success sharing their good news in the same neighborhood. It’s a religious conflict. The Freedmen challenge Stephen in public, trying to debate him into silence, but Stephen – called not as an apostle to preach, but as a deacon to serve – delivers such a powerful sermon that his opponents are silenced. Pride wounded, they begin a slander campaign against Stephen, saying that he has blasphemed against Moses and God, that he has been defaming “this holy place” (referring we suppose to Jerusalem) and the law (meaning the religious law of Israel), and that he has made public claims that Jesus will destroy the community and change the customs of Moses. The smear tactics work. Stephan is taken to the Sanhedrin and put on trial. After delivering a powerful testimony to the saving power of God at work throughout history, and now in Christ, we arrive at the verses read this morning. Stephen sees that the bullies are coming for him, but having spoken the truth, Stephen has a vision of “the Son of Man standing at the right hand of God.” This seems to be an allusion to the heavenly court, where Stephen’s testimony has been received by God with favor, in contrast to the earthly court, which has sentenced him to death. From there, Stephen is taken outside the city and stoned to death, which was the legal practice for those found guilty of the crimes he’d been charged with. Present for this execution is one Saul, who will later have a vision of his own in which Christ appears and asks, “Saul, Saul, why do you persecute me?” But where Stephen’s earthly sentence is death by stoning, Saul’s heavenly judgment is mercy and forgiveness – because that is the God we serve, one of love and healing, justice and forgiveness. Which is why it’s so ironic then, that the experience many people have when they first encounter Christians is one of fear and anxiety. Passages like the one in our gospel reading for this morning, in which Jesus tells his disciples “I am the way, and the truth, and the life” have been stripped of their context and turned into stones, hurled at non-Christians, or even at Christians who believe differently from one another. Words that were offered among friends as signs of reassurance, that God is always going before us to prepare a place for us, whatever lies ahead, have been twisted into threats and used not only to worry people about the state of their own faith, but to attack others for theirs. So, what are we asking for? What great work is being asked of us? As we tidied up in the kitchen during yesterday’s spring cleaning, I was sharing some of these stories with Noel. Despite the dire urgency of the unexpected requests that kept coming in this week, the thing I couldn’t help but notice was that people in our neighborhood who need help are turning to us. I hope you understand how significant that is. It means that after decades of service, service not so different from that offered by Stephen the deacon who was called to make sure that everyone in the community had enough to eat, people in this neighborhood — the ones who come in the mornings for groceries, or in the evening for meals, or in the night for support as they heal from their addictions, or on Saturdays to connect with each other with a broom in one hand and a sandwich in the other, or on Sunday mornings to draw strength and encouragement for the week ahead — people in this neighborhood have seen your work, have taken it to heart, have decided that you really mean it. That is why they trust you enough to turn to you now and ask for your testimony. First Peter names Jesus, the one who rolled the stone away from the grave so that all who lived in fear of death might find new hope and new life the “cornerstone” of a new home. That is the kind of church I want to belong to, and the kind of world I want to live in. One in which each of us sees ourselves as living stones, creating safe spaces for all God’s children to live and learn, work and play. Houses of worship and banquet halls of plenty, where all are welcome and there is always enough. Houses of mercy. Please God, let it be so. Amen.